Ski cap - (Die Einheitsfeldmutze M43) This was a new form of military headdress introduced on 11th June 1943, it became very popular amongst the Grenadiers - members of Kompanie 1 are allowed to wear this. The National Emblem and the Reichskokade were displayed on the centre front of the cap combined in a T shape. Army officers wearing the Einheitsfeldmutze displayed silver piping around the crown of the cap. Members should use the M40 or M43 tunic and trousers. 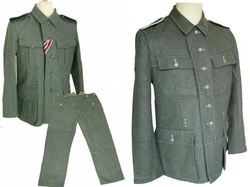 The M40 tunic was first issued in 1938 and remained in service until the end of WW2. It replaced the M36 tunic. The most obvious difference being the colour of the collar which became field grey matching the rest of the tunic. The M43 was designed to help produced a more cost effective garment. No box pleats on the pockets and pockets flaps cut straight were among the more obvious new features. Shoulder Boards - (Schulterklappen und Schulterstucke) Kompanie 1 members can use the Dark Green or Field Green GD shoulder straps. On 23 June 1943 two white bands were placed around the straps to show the difference between the Panzer Grenadier (white) and Panzer Fusilier (red) Regiment Grossdeutschland. This is provided by the Kompanie to sew on. Cuff title - Instituted on 7th October 1940. Was worn by all ranks of Infanterie Regiment Großdeutschland and the Fuhrer-Begleitbataillon. It is 3.2cm wide in black material with silver edging and silver hand stitched German script lettering. Belt and Buckle - (Koppel und Koppelschlosser) The buckle has the words Got Mit Uns (God is with us), an old Prussian motto. A real paradox. The buckle stamping and manufacturing required more then eight processes. Buckles were made in steel or aluminium. Belts were made of high grade leather with thickness up to 5mm and 4.5cm wide. Members can use the black leather marching boots (marschstiefel) or the short lace up ankle boots (schnurschuhe). In addition to the ankle boots, green canvas and leather reinforced (stoff gamaschen) were issued. They were introduced in 1943 and issued in ever increasing numbers to replace the shortage of leather marching boots. A white blouse (long or short sleeved) is worn with a black tie under the uniform jacket. The signals pin badge can be seen on the tie. Signals Pin badge or "Blitz" pin badge. This insignia, repeated in cloth badges on the side of the cap & left arm gave these specific Helferin their Nick name "Blitzmädchen" or lightening girls. Note - The correct colour for this badge is Yellow On A Black Background. The correct cloth uniform badges are Yellow on a Green background. Helferin were German female auxiliaries who worked alongside all branches of the German Whermacht in very similar roles to the British ATS, WRAF & WRNS.